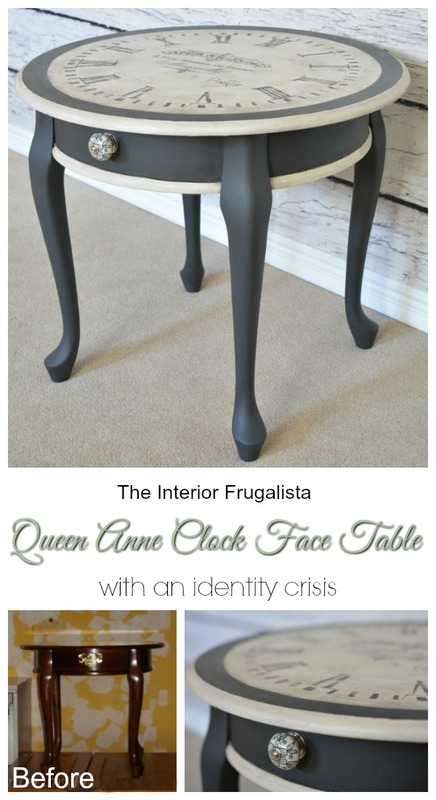 This poor Queen Anne table has had so many makeovers that it has an identity crisis. The first incarnation was in 2013, after acquiring it from a neighbor. It was one of my first furniture makeovers and I cannot help but laugh because the poor thing looked like a frog. 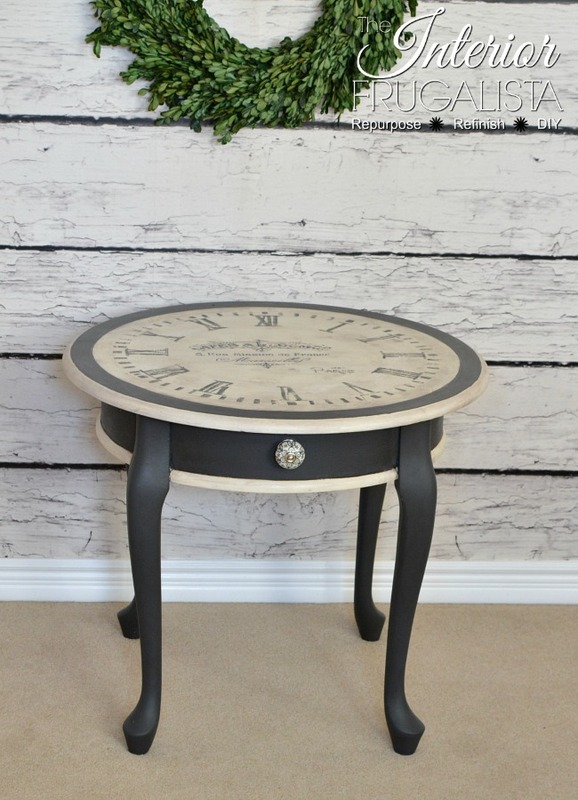 Thank goodness my furniture makeover skills have improved because its final incarnation painted black is quite lovely as an Old World Clock Face Table. On the bottom right in the photo collage above is what the table looked like when given to me by a neighbor. 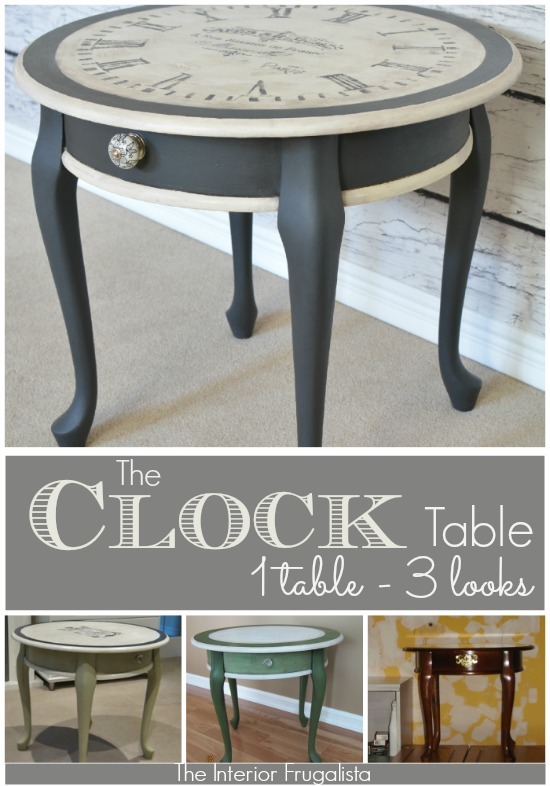 When I started refinishing furniture in early 2013, my preferred paint medium was milk paint. The table was painted in a combination of Miss Mustard Seed Milk Paint in the colors; Lucketts Green, Boxwood, and Ironstone. 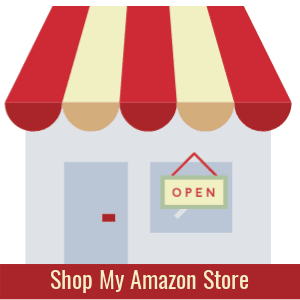 You can find that makeover here in my post Curbside Find Upcycle. The table sat in our living room for several months before I finally accepted the fact that it looked too much like a frog. 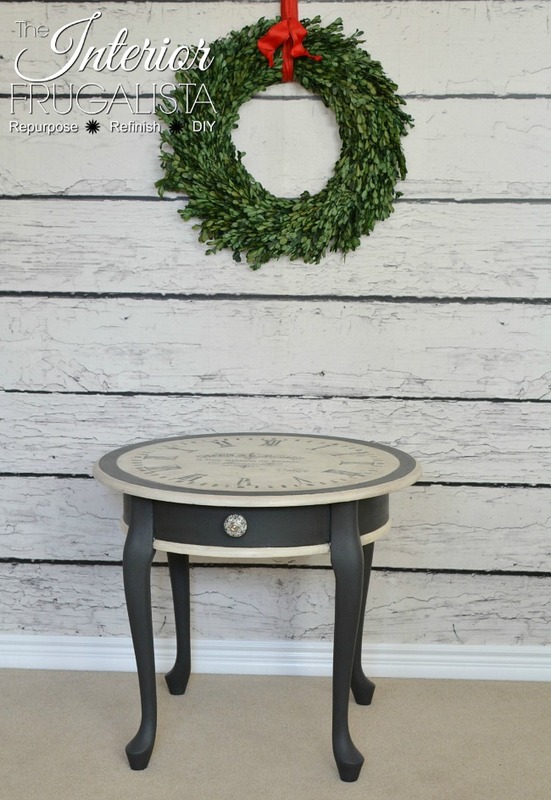 By the second makeover, I had discovered Annie Sloan Chalk Paint and gave it a new look with the paint colors Versailles and Old White. I gave it some Parisian flair by adding a Vintage Cloutèrie graphic with the intention of using the table in our guest bedroom. 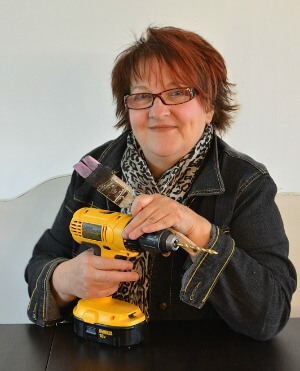 You can catch that makeover here in my post From Curb To Français. Instead, the table was given to my Mom when we moved her into a secured dementia suite at a designated care facility to add some personality to a rather institutional looking room. Unfortunately, it was receiving a lot of abuse and at one point the glass knob was walloped off and so it came back home with me. Thank goodness my furniture makeover skills have improved because finally, this poor Queen Anne table has a look that I can be proud of. 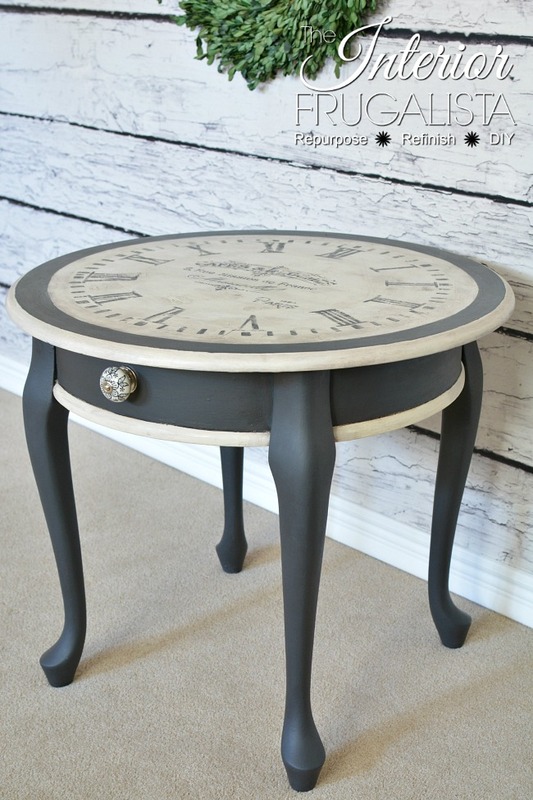 The table was painted again using Annie Sloan Chalk Paint but using the colors Graphite and Old White. The broken glass knob from the previous makeover was replaced with this pretty floral ceramic one. 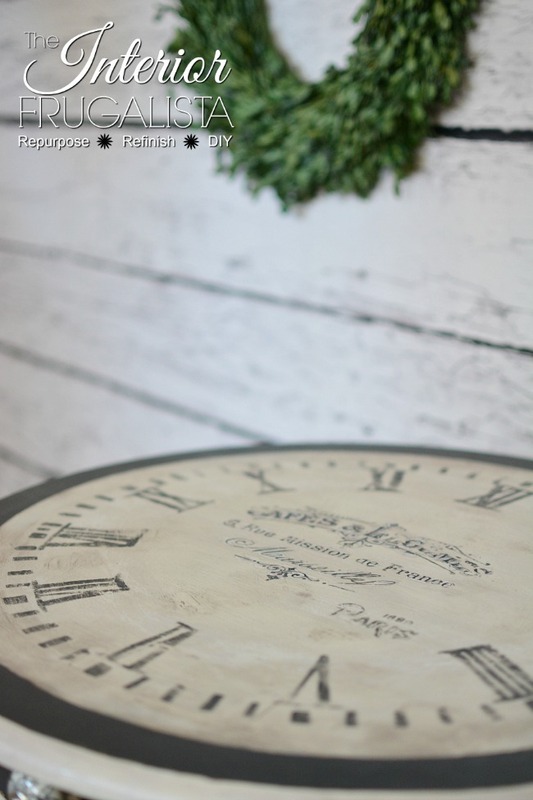 I went back to the Graphics Fairy and found the perfect French Clock Parts Graphic and French Cafe Typography. Using my preferred image transfer technique, I printed the graphics and taped them onto the top of the table. Slipping a sheet of graphite paper underneath, I tried the graphics on the table top. 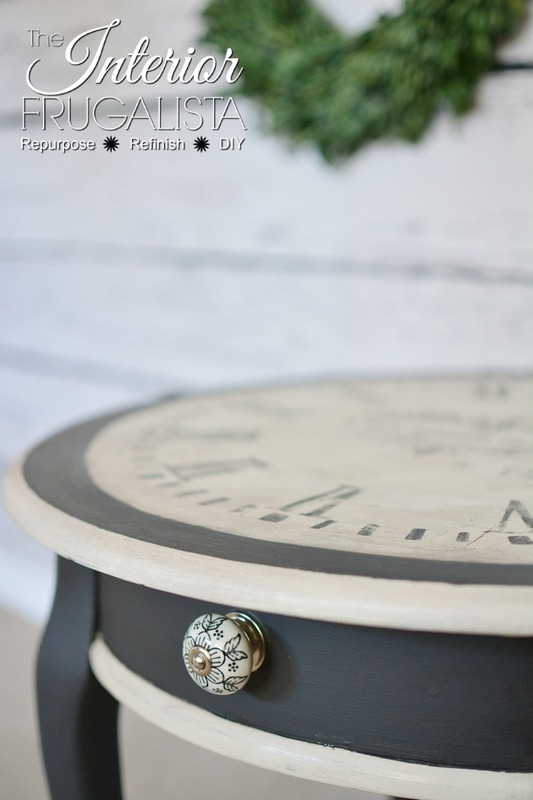 Using a script liner art brush and chalk paint in the graphite color, I painted the graphics onto the table. Wanting an aged time-worn appearance, I heavily distressed the graphics with 220 grit sandpaper and applied dark wax. The lesson I hope you walk away with after reading this post is, it's just paint. If you have a piece of furniture, whether it's been in your home for decades or something you recently acquired, don't be afraid to give it a new life with a can of paint. You're not going to ruin Aunt Martha's hutch if you get it wrong the first time. 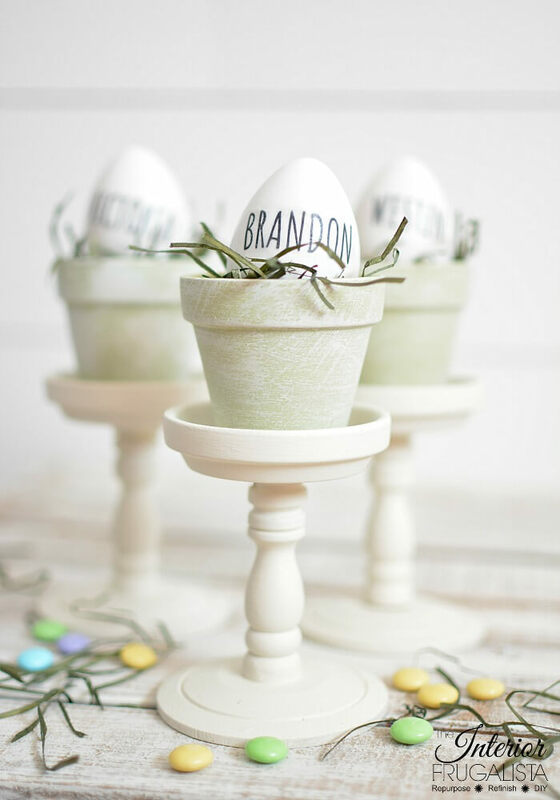 That's the beautify of chalk or milk paint, if you're not 100% satisfied with the results, you can change the color with little to no prep. Brush yourself off, like I did...twice, and keeping painting until you're happy with the results. I'm sharing this project with these fabulous PARTIES. I like this version. The knob is the perfect accent.